Ryan Blaney picked up the 1st last-place finish of his NASCAR Sprint Cup Series career in Sunday’s CampingWorld.com 500 at the Talladega Superspeedway when his #21 Motorcraft / Quick Lane Tire & Auto Center Ford lost an engine after he completed 84 of the race’s 196 laps. The finish occurred in Blaney’s 16th series start. The 21-year-old son of sprint car legend, NASCAR veteran, and 2009 LASTCAR Cup Champion Dave Blaney has enjoyed a meteoric rise through the ranks. In 2011, he won his lone K&N Pro Series West start at Phoenix, then in 2012 signed with Brad Keselowski’s Camping World Truck Series team, which he’s since carried to four wins and a 2nd-place showing in the 2014 point standings. In 2012, he finished 7th in his XFINITY Series debut at Richmond driving for Tommy Baldwin, Jr., and he soon found himself sharing a fleet Penske Racing ride with Keselowski and Joey Logano. Blaney’s first of three XFINITY victories came at Kentucky in 2013, and he followed this by a 27th-place run in his Cup debut for Penske at Kansas in 2014. This year, Blaney’s triple-duty schedule was skewed toward more Cup and XFINITY Series starts with a handful in Trucks. 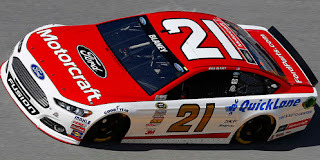 His Cup ride for 2015 was with the Wood Brothers, whose iconic #21 was vacated by Trevor Bayne the previous season. The Woods’ venerable single-car operation has become a satellite Penske team, its cars prepared alongside those of Keselowski and Logano, and there are indications - but as yet nothing confirmed - that he will run full-time for Penske in the near future. In the meantime, Blaney’s second season in Cup would remain on a part-time basis. This past May, the Talladega track was the scene of Blaney’s career-best Cup finish when he finished 4th after starting 3rd, following Dale Earnhardt, Jr., Jimmie Johnson, and Paul Menard across the finish line. However, other than that finish and a 7th last week at Kansas, Blaney’s 2015 Cup schedule has been marred by several frustrations. Coming into Sunday’s race, he’d lost engines in three of his 14 starts and missed another three when rain washed out qualifying, eliminating his ride from the field based on a lesser number of race attempts. Heavy cloud cover moved in through the weekend, but this time the rain stayed away. On Friday’s opening session, he put up the 20th-fastest time and was 2nd of the 30 drivers in Happy Hour behind Keselowski. He made it through the first round of qualifying and settled for 9th in the race for the pole, putting up a lap of 192.509 mph. This time, the two drivers missing the race were two team cars debuting new sponsors: the #23 Overture Toyota of rookie Jeb Burton - his eighth of 2015 - and Michael Annett, whose #46 PJ Fresh / Flying J Chevrolet missed its first race since Atlanta in February. While in Atlanta, Annett secured a ride from Circle Sport in the #33, this time Travis Kvapil remained in the ride and would roll off 42nd on Sunday. Starting 43rd on Sunday was Chase contender Martin Truex, Jr., whose #78 Furniture Row / Visser Protection Chevrolet had its time disallowed when he went below the line during his lap in the first session. Joining him in the rear were fellow Chevrolet drivers Danica Patrick, Tony Stewart, and Justin Allgaier, whose cars were repaired before the race. Ryan Newman, 10th in points entering the event, also conceded his 18th starting spot to drop to the back. But before a single lap was completed, 43rd went J.J. Yeley, whose #26 Adirondack Tree Surgeons Toyota spent the opening three laps on pit road. On Lap 3, Timmy Hill pulled the #62 Royal Teak Collection Ford behind the wall, dropping him back in his first Cup start since Dover earlier this month. Yeley’s return on Lap 4 dropped Hill to last on Lap 6, but Hill then came back out on Lap 9, 7 circuits behind the leaders. At this point, Hill and Yeley were running by themselves, just a few seconds ahead of the leaders. On Lap 18, the leaders caught Hill entering Turn 1, and he guided the #62 safely up the track to let the traffic pass three-wide below him. Yeley was caught a few laps later, and the two remained on-track, albeit at a slower pace than many of the frontrunners. As the race remained under green, the two drivers held the final two spots until nearly the one-half mark. Coming off Turn 2 on Lap 86, Blaney’s #21 slowed suddenly in the high lane, forcing the leaders to take another evasive maneuver to avoid him. He made it safely to pit road without drawing a caution, but the crew quickly discovered an engine problem that ended their day for a fourth time in 2015. Blaney fell to 43rd on Lap 94, lifting both Yeley and Hill. Hill ended up 41st, his Ford suffering an electrical issue that made his car slow down the backstretch in the race’s closing stages. Yeley ended up one spot outside the Bottom Five in 38th, one spot ahead of Jamie McMurray, whose #1 Cessna Pink Chevrolet drew the second caution of the day when the engine let go while racing the leaders inside the final 5 laps. 40th went to Matt DiBenedetto, whose #83 Dustless Blasting Toyota dropped to 42nd on Lap 97 with mechanical issues of his own, but returned to the track before Lap 120 to come home 19 circuits back. Behind Hill in 42nd was Justin Allgaier, whose struggles in practice and qualifying were capped by an engine failure on his #51 Auto Owners Insurance Chevrolet that ended the race’s opening green-flag run of 132 laps. *This is the first last-place finish for the #21 in a Cup race at Talladega since May 5, 2013, when Trevor Bayne’s own turn in the Motorcraft / Quick Lane Tire & Auto Center Ford ended due to engine issues after 22 laps of the Aaron’s 499. Landon Cassill picked up the 9th last-place finish of his NASCAR Sprint Cup Series career in Sunday’s Hollywood Casino 400 at the Kansas Speedway when his #40 Carsforsale.com Chevrolet fell out with engine issues after he completed 127 of 269 laps. The finish, which occurred in Cassill’s 182nd series start, was his fourth of the season and his first since Bristol in April, 23 races ago. With five races remaining, Cassill has sole possession of the overall lead in the LASTCAR Cup Series standings for the first time since Loudon in July. Heading into Sunday’s race, Cassill was tied with Alex Bowman with 3 last-place runs apiece with Cassill leading the bottom-five tiebreaker 12-9. CORRECTION (Oct. 21): Cassill and Bowman entered Kansas tied for the LASTCAR lead with 3 last-place finishes and 6 bottom-fives each. Cassill led the bottom-ten tiebreaker 12-9 over Bowman. Yeley entered Kansas with 2 last-place finishes, 6 Bottom Fives, and 19 Bottom Tens. Thus, if Yeley held the last-place run at Kansas, he would have tied Cassill with 3 lasts and 7 Bottom Fives, but won a new bottom-ten tiebreaker of 20-13 with 31st-place Bowman still at 9 Bottom Tens. Cassill has had a busy year, both on and off the track. In May, immediately following a 39th-place finish in the Coca-Cola 600, he completed a nearly 14-mile run from the track to the NASCAR Hall of Fame. Less than two days later, Cassill’s wife Katie gave birth to their first son, Beckham. And in August, Cassill beat fellow underdog Josh Wise by six minutes in the grueling Ironman World Championship in Austria. Cassill has also continued to juggle full schedules in both the Sprint Cup and XFINITY Series, earning a series of strong runs along the way. Driving the #01 entry for JD Motorsports in XFINITY, Cassill has picked up a pair of top-ten finishes with a season-best 8th at Darlington. In Cup, he returned to the scene of his last-place run in the Daytona 500 to score a season-best 13th after the grinding last-lap crash. Last month at Pocono, one week after he lost 10% of his body weight during a hot afternoon at Indianapolis, Cassill nearly bested the Daytona run when he finished 14th. A third top-twenty finish again came at Darlington, where his 2001 Sterling Marlin tribute scheme crossed the line 20th. Sights next turned to Kansas, where he finished 29th in May. Cassill ran double-duty once more, finishing 18th in Saturday’s XFINITY race after starting 20th. In Cup, Cassill was 40th-fastest of the 44 entrants during opening practice and held the 41st spot in qualifying with a lap of 185.618 mph. Cassill made the show on Owner Points while Timmy Hill and Premium Motorsports’ #62 missed their second-straight race. On Saturday, Cassill ran 39th in the second practice and matched that rank in Happy Hour. Starting 43rd on Sunday was ARCA regular Will Kimmel, making his first Cup start since Kentucky in July. Kimmel’s #32 Skuttle Tight Ford for Go Green Racing held the last spot during the first 30 laps and was the first to be lapped on the 17th circuit. On Lap 31, Kimmel conceded the spot to J.J. Yeley, whose lapped #26 Honey Creek Outfitters / Maxim Toyota smacked the outside wall in Turn 2. The wreck required nine laps for cautious track crews to clean up fluid from Yeley’s machine, and it appeared Yeley would tie Cassill and Bowman for the LASTCAR lead. Even if Yeley did, he would not win the tiebreaker - Yeley had just 6 bottom-five finishes coming into Kansas, trailing Cassill’s 12 and Bowman’s 9. Around Lap 130, Cassill made an unscheduled trip to pit road with engine issues, and ultimately became the first retiree from the event. He entered the Bottom Five on Lap 134 - just as BK Racing managed to get Yeley’s #26 back on track, 105 laps in arrears. 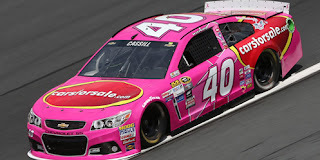 If Yeley remained on track from that point, he would drop Cassill to last on Lap 249. However, on Lap 233, Yeley again lost several laps and it appeared he would come just sixteen laps short of making 42nd. Yeley returned on Lap 238 and finished the race under power, finally bumping Cassill to the rear on Lap 252. 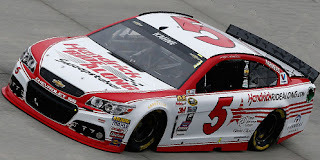 Yeley finished 42nd, unable to catch two other drivers felled by separate mid-race accidents. 41st-place Austin Dillon and his #3 American Ethanol Chevrolet had raced all the way from the 25th starting spot to the Top 5, making the most of the high line. The Chicagoland last-placer looked to be on his way to his second-straight top-ten finish before a tire went down on Lap 156, stuffing his car into the outside wall in Turn 2. 40th-place Clint Bowyer clobbered the same spot much harder on Lap 172, his #15 5-Hour Energy Toyota bouncing onto two wheels before grinding the entire length of the backstretch. Both dropped beneath 39th-place Kimmel, who came home 14 laps down in the #32. Next week at Talladega, Cassill looks to bounce back at the track where he scored his first Cup Series top-five finish - a 4th - in the 2014 running. *This marks the first last-place finish for the #40 in a Cup race at Kansas, but not for Cassill, who scored his first Cup last-place finish in the same race on October 3, 2010 when his #64 Little Joe’s Autos Toyota fielded by Larry Gunselman broke the rear gear after 3 laps of the Price Chopper 400 presented by Kraft Foods. 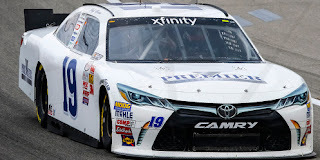 Jeff Green picked up the 80th last-place finish of his NASCAR XFINITY Series career in Saturday’s Kansas Lottery 300 at the Kansas Speedway when his #19 Premier Barter Exchange Toyota fell out with suspension issues after he completed 3 of 204 laps. Green did not participate in Friday’s opening practice session, but ran a solid 27th-best in Happy Hour. He defended the spot in qualifying, improving by nearly half a second to earn 27th on the grid with a speed of 175.262 mph. 41 cars arrived at the track, but though he ran 33rd-fastest in Happy Hour, Mario Gosselin withdrew his #92 CrashClaimsR.us Chevrolet before qualifying, guaranteeing the remaining entrants a spot in the field. Starting 40th on the grid was Jennifer Jo Cobb, who was making her first XFINITY Series start since this same race last year, when she came home 24th in Rick Ware’s #87. According to a trackside report, Cobb’s #10 Mark One Electric / Precision Roofing Chevrolet was probably the oldest car in the field. The plain white Chevrolet began its life as a “Car of Tomorrow” chassis for DEI’s Cup team, then in 2011 became the #68 Fleur-De-Lis Motorsports ride, perhaps the same one Matt Carter finished last with during that year’s spring race at Richmond. 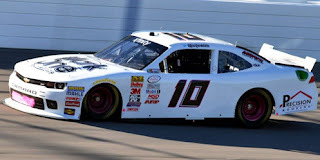 Cobb’s ride was originally listed as a TriStar Motorsports entry, making it the first start by TriStar’s #10 since April at Talladega, the last race before Jeff Green assumed Mike Bliss’ vacated ride at Iowa. However, by being a Chevrolet instead of a Toyota and with Cobb’s identical Truck Series numbers on the car, this was likely not the case. Regardless of origin, Cobb ended up 29th on the day after she crashed on the frontstretch with 55 laps to go, collecting the #90 Halcyon Mobile Chevrolet of Korbin Forrister. Forrister’s crash capped a difficult day for Bobby Dotter’s two-car SS-Green Light Racing team, which also kicked-off the battle for 40th spot. On Lap 2, as Cobb followed the rest of the field into Turns 1 and 2, B.J. McLeod in Dotter’s #15 Main Gate Enterprises Chevrolet lost control and backed into the outside wall, drawing the first caution of the afternoon. McLeod, who also struggled with an ill-handling car in qualifying despite a 29th-place starting spot, briefly held the last spot while Green pulled the #19 behind the wall under the yellow to drop to 39th. When the #15 later returned to the track, Green slipped back to 40th. McLeod retired after 79 laps, the handling issues too bad to continue, and finished 33rd. Following Green in the Bottom Five were owner-drivers Derrike Cope and Mike Harmon. For Cope, the engine failure on his #70 Maxelence MVP / To The Point Chevrolet was his worst finish of the season, his day over after only 14 laps. Harmon’s 38th-place run was his worst since a 39th at Richmond in May, an engine problem of his own stopping the #74 Skin & Bones Dodge. 37th went to Timmy Hill, who after missing the field for the Cup race pulled behind the wall in Motorsports Business Management’s #40 Grafoid Chevrolet. Rounding out the Bottom Five was 36th-place T.J. Bell - his third-straight 36th-place finish in JGL Racing’s unsponsored #26 Toyota. 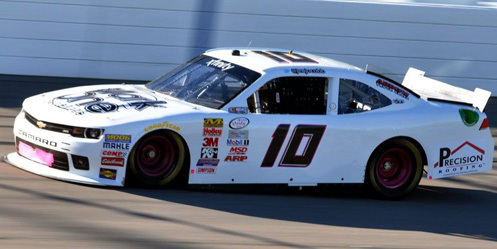 *This is Green’s third last-place finish in an XFINITY Series race at Kansas, the other two also coming with TriStar Motorsports in 2010 and 2013. *This is the first last-place finish for the #19 in an XFINITY Series race at Kansas since the inaugural event on September 29, 2001, when Ed Berrier’s #19 Tiger Saws & Blades Chevrolet crashed after 10 laps of the Mr. Goodcents 300. Green won the race that day - the 14th of his career and his 10th and final driving for team owner Greg Pollex in the #10 Nestle Nesquik Ford. Kasey Kahne picked up the 2nd last-place finish of his NASCAR Sprint Cup Series career in Sunday’s Bank of America 500 at the Charlotte Motor Speedway when his #5 HendrickRideAlong.com Chevrolet was involved in a single-car crash that ended his run after 58 of 334 laps. The finish, which occurred in Kahne’s 426th series start, is his second of the season and first since the August race at Pocono, nine rounds ago. Following his sudden exit from the Pocono race, Kahne has continued to struggle through his worst season since 2007. The crash dropped him from 13th to 15th in points, and another crash during a restart the next week at Watkins Glen left him 42nd, dropping him to 17th and out of the Chase. In the four races through the Richmond cutoff, Kahne bounced back with four-straight finishes between 12th and 18th, but the efforts fell short of a Chase berth. Coming into Charlotte, where Kahne had scored four series victories, he’d earned two-straight top tens at Loudon and Dover, finishing 9th and 6th, respectively. Kahne came to the track once again running the 1984 “throwback” scheme he debuted at Darlington. The car showed speed early, putting up the 5th-fastest time in Thursday’s opening session before settling for 20th in qualifying with a speed of 190.436 mph. Kahne’s speeds cooled on Friday with a 12th-best lap in the second session and a 19th in Happy Hour, but the team prepared to make a run on Saturday night. Persistent rain pushed the race to Sunday morning, where the 40th starting spot belonged to the #33 Little Joe’s Auto Chevrolet of Alex Kennedy. Kennedy, making his 12th start of the season and second in a row, was locked into the field on points, besting the only two DNQs of Josh Wise in the #32 Rimrock-Devlin Development Ford - the fifth DNQ of the year for Go Green Racing - and the #62 ChampionMachinery.com Chevrolet of Timmy Hill. Premium Motorsports’ #62 has now missed 17 races and qualified for only 13. Teammate Reed Sorenson made the show one spot in front of Kennedy in 42nd driving the #98 VIPRacingExperience.com Ford. The moment the green flag flew on Sunday morning, however, the rear of the field checked-up as the slowing leaders took advantage of NASCAR’s newly-expanded restart zone entering the quad-oval. Several cars narrowly avoided contact before 41st-place starter Jeb Burton’s #23 Dr. Pepper / Breast Cancer Awareness Toyota rear-ended 39th-place Cole Whitt’s #35 Rinnai Tankless Water Heaters Ford. The caution fell immediately as Burton’s car dropped debris on the track from its destroyed left-front fender. Although the crew did manage to keep Burton on the lead lap for the Lap 5 restart, the leaders blew by him on Lap 8. 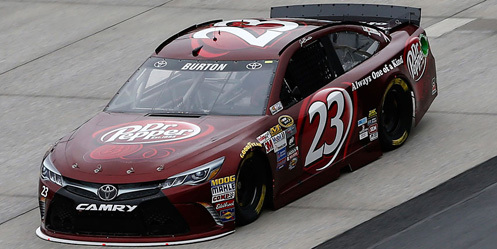 As Burton struggled to keep pace, BK Racing decided to bring his ride behind the wall around Lap 31. Meanwhile, on Lap 41, Kahne had worked his way to 12th when his #5 cut a right-front tire and made hard contact with the wall in Turn 1. No caution fell for the incident, and the resulting green-flag stop dropped him two laps down to the field in the 40th spot. Between Kahne and Burton were Whitt, his car damaged in the first-lap caution, and Burton’s teammate J.J. Yeley, who lost four laps after NASCAR penalized him for the crew allegedly manipulating the right-rear sheet metal during a pit stop. Kahne was still 40th on Lap 61 when another right-front let go, sending him even harder into the Turn 1 wall. This time, the caution did fly and the #5 went behind the wall with heavy damage. He would not return to the race. Burton, meanwhile, came back out with a large patch sealing shut his damaged left-front fender. He retained the 43rd spot until around Lap 146, when he finally passed the retired Kahne. 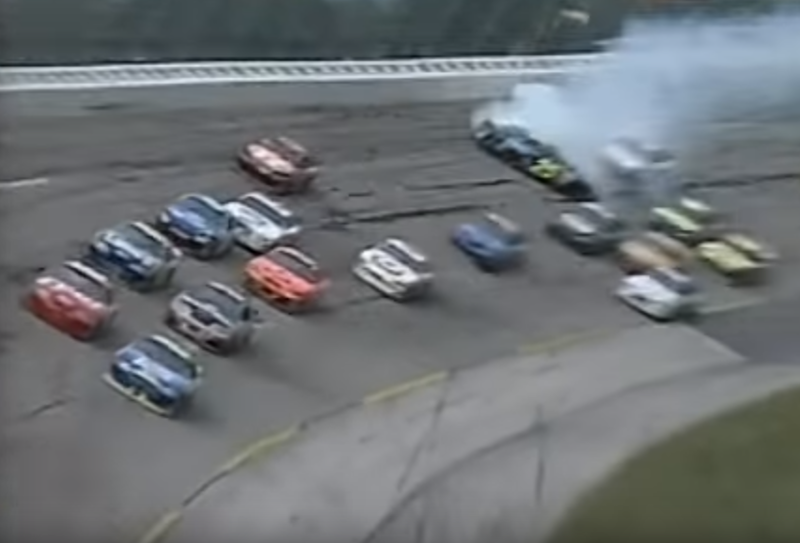 With Burton and the 41 remaining competitors still running, however, this created the potential for a bad day for a Chase driver to turn out much worse. 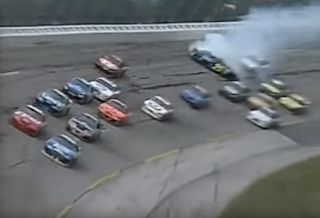 That victim was polesitter Matt Kenseth, who after leading 72 laps in his #20 Dollar General Toyota found himself in the middle of the pack after pit stops. Two separate collisions with Ryan Newman’s #31 Caterpillar Chevrolet later, Kenseth’s car had similar damage to Kahne and was struggling to keep pace. The second wreck brought out a caution on Lap 178, and while the Joe Gibbs Racing crew had time to make repairs, their efforts fell short. On Lap 241, Kenseth’s Toyota slammed the Turn 3 wall hard enough to knock him out of the race. Just two laps later, Kenseth had plummeted all the way to 40th - and out of the race. By the time Kenseth withdrew, Burton’s lapped machine was joined by Justin Allgaier, whose #51 Brandt Chevrolet was also heavily damaged in a restart pileup on Lap 183. The crew managed to change radiators and get the car back on track on Lap 261 - just in time for Jimmie Johnson to suffer his second-straight catastrophic mechanical failure. This time, the oil cooler broke on the #48 Lowe’s Red Vest Chevrolet, and after an unscheduled stop, Johnson’s car was pushed behind the wall just as Allgaier left the garage. Allgaier’s car was still smoking on the apron when he returned, but he managed to keep pace, just seven laps behind Burton in 42nd. No other cautions fell in the final 88 laps on Sunday, and both Burton and Allgaier were in position to gain spots in the closing stages. With just 15 laps to go, Allgaier passed Kenseth, and Burton followed suit with just 8 circuits remaining, dropping the #20 all the way to 42nd - tied for his worst finish of the year with the engine failure two months ago in Bristol. Both lapped cars of Allgaier and Burton were not quite able to catch 39th-place Jimmie Johnson, who beat them both by five and 13 laps, respectively. Three of the race’s only five DNFs made the Bottom Five. In the LASTCAR Cup Series Champonship, co-leaders Alex Bowman (finished 32nd) and Landon Cassill (finished 23rd) not only did not finish last, but both finished outside the Bottom Ten. Thus, Cassill still leads the title on the bottom-ten tiebreaker, 12-9. *This marks the first time the #5 has finished last in a Cup race at Charlotte since October 10, 1971, when Jim Vandiver’s Doc Faustina-owned 1970 Plymouth crashed after 10 laps of the National 500. It was the second of five career last-place runs for Vandiver, the Huntersville, North Carolina native who also edged polesitter Buddy Baker for last by 11 laps in the historic 1979 Daytona 500. Vandiver’s best finish in 85 Cup races from 1968 through 1983 was a 2nd to Richard Brickhouse in the inaugural Cup race at Talladega in 1969 - just his second series start. He passed away this past June at age 76. *Chevrolet sweeps both Cup Series lasts at Charlotte for the first time since 2004, when Joe Auer’s #51 Chevrolet overheated with Kevin Lepage after 56 laps in May, then crashed with Tony Raines after 2 laps in the fall. Jeb Burton picked up the 1st last-place finish of his NASCAR Sprint Cup Series career in Sunday’s AAA 400 at the Dover International Speedway when his #23 Dr. Pepper / Estes Express Lines Toyota was involved in a single-car crash that ended his run after 186 of 400 laps. The finish occurred in Burton’s 23rd series start. Son of 2002 Daytona 500 champion Ward, the 22-year-old second-generation racer and 2013 Truck Series winner at Texas nears the end of his first Sprint Cup season. He entered the Dover race 38th in points with a season-best 29th at Martinsville in March, missing the field six times but scoring just three DNFs all season. Last month at Darlington, where Burton ran a “throwback” scheme reminiscent of Ward’s Caterpillar Dodge, BK Racing decided that Burton and teammate J.J. Yeley should swap rides, allowing Yeley the opportunity to bring Burton’s original #26 team higher in Owner Points. Both driver and team looked to continue this effort at “The Monster Mile,” where Burton came home 30th in June. The approaching Hurricane Joaquin brought enough rain to wash out Friday’s on-track activities, including both qualifying and the opening practice, and Burton secured the 39th spot on the grid. Travis Kvapil, set to be the only DNQ because of the washout, withdrew along with The Motorsports Group’s #30 Chevrolet team on Thursday. When Joaquin changed course and Saturday allowed for two practice sessions, Burton timed in 33rd and 41st. Starting last in Sunday’s field was Timmy Hill, who brought back the black-and-gold scheme on the #62 Premium Motorsports Chevrolet campaigned earlier this year by Brendan Gaughan. As the field gridded up, however, Hill was joined by Martin Truex, Jr., whose team was penalized for apparently pulling out the right-rear fender well on the #78 Furniture Row / Denver Mattress Chevrolet. When the green flag dropped, Truex began his climb through the field, giving Hill the 43rd spot by the end of the first lap. Heading into Turn 1 on Lap 3, Burton was racing Josh Wise’s #32 Schwarze Sweepers / CorvetteParts.net Ford for position when Wise bumped Burton into a spin, drawing the first caution of the day. While neither car was seriously damaged, both briefly exchanged the 43rd spot after yellow-flag pit stops. On the Lap 6 restart, both passed Hill and dropped the #62 back to last, where he remained for most of the early stages. Hill was the first to lose a lap on Lap 19, went down a second on Lap 33, a third by Lap 54, and a fourth on Lap 70. Hill was still on the track with the rest of the field when the last-place battle took a dramatic turn. Ten-time Dover winner Jimmie Johnson entered the race fifth in points and, despite not being locked-into the Challenger Round, was expected by many to easily make the cut. An early pit road speeding penalty dropped the #48 Lowe’s Chevrolet to the back of the field, but he was making up ground when he made an unscheduled stop on Lap 103. The crew quickly discovered the car was leaking rear-end fluid from a busted seal behind the right-rear wheel, forcing the #48 to become the first car behind the wall. By Lap 108, Johnson had not only taken last from Hill, but was suddenly at least ten points behind the cut line. Sunday marked Johnson’s 500th Cup Series start, and in the 499 previous, the six-time champion had never once finished last. Four times in his fifteen-year career, including twice last season, Johnson just barely extended the streak by coming home 42nd. If the Hendrick Motorsports crew were unable to get Johnson back into the race, it would have been the first last-place run for the #48 since James Harvey Hylton’s 9th and final last-place run at Rockingham in the spring of 1993, and the first for the number at Dover since Freddie Crawford’s lone Cup start ended with a dropped cylinder on his Hylton car in 1990. Then, on Lap 140, Johnson rejoined the race 36 laps down and promptly lost a 37th as Kevin Harvick’s dominant Budweiser Chevrolet flew by. While Johnson regained this lap on Lap 149, he remained in 43rd as the entire field was still under power. To make the Chase, Johnson now needed at least six cars - preferably Chasers - to fall out before the closing stages. But unfortunately for Johnson, the number of Cup Series retirees has dropped in recent years while “start-and-park” efforts in Cup have all but disappeared. Twice in 2015, all 43 cars finished under power, and two other times, just one car failed to finish. It was not until Lap 192 that another car came to grief. This time, it was Burton himself, his #23 slammed into the wall in Turn 2. Burton climbed out apparently uninjured as his car caught fire, and soon after his entry was retired from the race. Already laps down at the time of the crash, Burton fell to 43rd on Lap 222, again saving Johnson from his first 43rd. But in the end, Johnson gained just one more spot - the #34 CSX “Play It Safe” Ford of Brett Moffitt that wrecked on Lap 355 - and did so with just 17 laps remaining. Johnson ended up 41st and missed the cut by 12 points. Hill finished on track 20 laps down in 39th, having passed Landon Cassill, whose engine let go on his #40 CRC Brakleen Chevrolet with 27 laps to go. With seven races remaining, even drivers who have yet to finish last in 2015 are still mathematically in contention to claim the LASTCAR Cup Series Championship. Cassill remains tied with Alex Bowman for the lead with three finishes apiece. In the tiebreaker, Cassill’s 40th-place run on Sunday matches Bowman’s six bottom-five finishes, so Cassill now leads on Bottom Tens, 12-9. *This is the first last-place finish for the #23 in a Cup Series race at Dover since June 5, 1988 when Eddie Bierschwale’s Wayne Paging Oldsmobile dropped a valve after 15 laps of the Budweiser 500. It was the third and final last-place finish for Bierschwale, a Texan driver who competed mostly for his family-owned team in 117 starts from 1983 through 1992. Bierschwale’s best Cup finish was a 10th in the 1989 Daytona 500 - a race he started, but did not finish. A crash in the qualifying races put Kyle Petty out of the starting lineup, and team owner Felix Sabates bought Bierschwale’s ride, putting Petty’s Peak Antifreeze logos on Bierschwale’s unsponsored Oldsmobile. The arrangement was made for Bierschwale to start the race, then hand over the ride to Petty during an early caution. The exchange was made, but under NASCAR rules, Bierschwale is credited with his only top-ten finish. Jeff Green picked up the 78th last-place finish of his NASCAR XFINITY Series career in Saturday’s Hisense 200 at the Dover International Speedway when his #19 Premier Barter Exchange Toyota fell out with suspension issues that ended his run after 4 of 200 laps. The finish, which occurred in Green’s 415th series start, was his 18th of the season and his first since Chicagoland, two races ago. With five XFINITY races to go in 2015, Green now has 83 last-place finishes across NASCAR’s top three divisions. Following the decision of Athenian Motorsports to withdraw John Wes Townley’s #25 Zaxby’s Chevrolet, Green and the 39 drivers who remained all secured starting spots in Saturday’s race. With practice and qualifying washed out by Hurricane Joaquin, however, Green would start 31st based on Owner Points for a race where nobody knew how their cars would handle. The rains held off for most of Saturday’s race, and a surprisingly competitive battle for 40th began. Just as in Sunday’s Cup race, the final starting spot went to Timmy Hill, who this time took the helm of Rick Ware’s #17 4Caring.org Chevrolet. The #17 was originally slated to be Ryan Ellis’ ride, but a win in an online pole awarded Ellis with a ride in Obaika Racing’s #97 Vroom! Brands Chevrolet, which started next to Green in 30th. Hill held the spot for just a few moments as Harrison Rhodes pulled behind the wall on Lap 2 with mechanical issues on his #0 JD Motorsports Chevrolet, dropping him to 40th. On Lap 5, Green pulled off the track, but was followed into the pits by two-time 2015 last-placer Dexter Bean, back in King Autosport’s #92 Gamache Truck Center / Cote Chevrolet. Bean, thus ranked one spot behind Green in 39th, returned to the track four laps down and conceded the spot to Green. Rhodes’ #0 rejoined the race 14 laps down on the 16th circuit, just as Ben Rhodes’ #88 Alpha Energy Solutions Chevrolet crashed in Turn 4 to bring out the first yellow. By then, Carl Long had also pulled his unsponsored #40 Motorsports Business Management Chevrolet behind the wall, and he and Green dropped to the final two spots on Lap 19. Bean ultimately ended his race after turning 17 laps and wound up 38th. Harrison Rhodes, the race’s first last-place finisher, made it up to 27th at race’s end as several drivers found trouble. Just 57 laps into the race, all twelve cars running 29th on back were already five or more laps down. Rhodes’ teammate Ross Chastain ended up 37th at the finish when his #4 Heroes Haven / Natchez Shooters Supplies Chevrolet crashed with Dakoda Armstrong in Turn 1 on Lap 25. As the field slowed for the Chastain-Armstrong caution, Ty Dillon’s #3 Yuengling Light Lager Chevrolet blew a tire in Turn 4 and slammed the outside wall, forcing the team to make 74 laps of repairs. Dillon held 36th during his ordeal and, upon his return, threatened to drop Ryan Ellis into the Bottom Five. However, Ellis, whose car lost several laps after a damaged control arm, returned to the track eleven laps in front of Dillon, and both proceeded to climb their way through the field. In the end, the two were the final two cars running with Ellis in 26th and Dillon in 28th. Rounding out the Bottom Five in their place was T.J. Bell, whose unsponsored #26 JGL Racing Toyta fell into the spot when the race restarted following the Lap 114 red flag for rain. Bell edged Hill for the spot by one lap, the latter having struggled with a bent throttle pedal on the #17. Finishing 24th in Saturday’s race was Joey Gase, whose #52 LifeCell / DonateLife-DE.org Chevrolet was nearly lost last Sunday. As the team returned from last Saturday’s race in Kentucky, the Jimmy Means Racing trailer caught fire, destroying much of the team’s equipment including the pit box, and a crewman suffered a burned hand helping the firefighters. Somehow, both Gase’s Kentucky car and the #79 Chevrolet team car survived the fire, and the cars were ferried to the track on one of Means’ old haulers from 1990. Bearing a winged Phoenix on the side, Gase earned the team’s second-straight top-25 finish. This Friday in Charlotte, LASTCAR.info will join several other supporters on the hood of Gase’s Chevrolet. Follow @LASTCARonBROCK with hashtag #LastMeansFirst for more updates. *Green sweeps both XFINITY last-place runs at Dover for the first time in his career. This year, Green has also swept both lasts at Chicagoland and Richmond and next week has the chance to do the same at Charlotte. 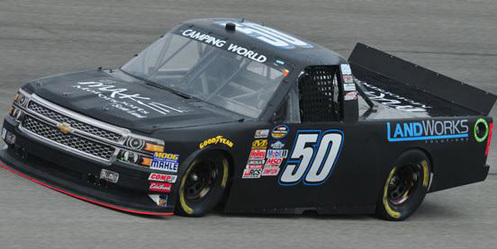 Tyler Tanner picked up the 3rd last-place finish of his NASCAR Camping World Truck Series career in Saturday’s Rhino Linings 350 at the Las Vegas Motor Speedway when his #50 Landworks Solutions Chevrolet fell out with ignition issues after he completed 5 of the race’s 146 laps. The finish, which occurred in Tanner’s 12th series start, was his 3rd of the season and first since Chicagoland, two races ago. Tanner now joins a three-way tie with Norm Benning and defending LASTCAR Truck Series Champion Caleb Roark for the lead in this year’s last-place standings. With five races to go, Roark leads Tanner by a single bottom-five finish, 7-6, while Benning trails with 3. Las Vegas would be Tanner’s tenth start of 2015 and his third with MAKE Motorsports, whose two trucks were late additions last Wednesday that brought the field to a full 32 entries. While teammate Travis Kvapil drove MAKE’s #1, Tanner would again climb aboard the #50 he brought to a 30th-place run last week at Loudon. Tanner was 31st-fastest in the lone practice, but lost valuable time when he brought out a caution for leaking fluid on the track in Turns 3 and 4. Tanner retained the 31st spot in qualifying with a lap of 161.861 mph. The 32nd spot in Saturday’s field went to Norm Benning, who was again running a jet black scheme on his unsponsored #6 Norm Benning Racing Chevrolet. He was joined by Erik Jones, whose Kyle Busch Motorsports team had changed engines on his #4 Toyota, and the #07 ScubaLife.com / NASE Worldwide Chevrolet of Ray Black, Jr., who missed the drivers meeting. At the end of Lap 1, however, Caleb Roark made a move for the spot in his #0 Driven2Honor.org Chevrolet. On Lap 6, Tanner then took the spot from Roark and was the first to be lapped when he went behind the wall. 31st went to Austin Theriault, who suffered a terrible wreck on Lap 15 when he tangled with teammate Tyler Reddick in Turn 4 and slammed head-on into a spot just feet from the edge of the SAFER barrier. Theriault climbed from his truck, but suffered a compression fracture of his spine in the accident. Roark, who was coming down pit road when Theriault and Reddick tangled, returned to the track to complete two more laps before retiring as well finishing 30th. 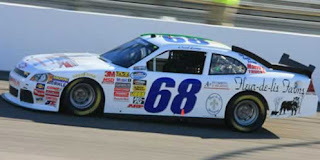 29th went to Justin Jennings, again in MB Motorsports’ #36 Mittler Brothers Machine & Tool Chevrolet while Japanese driver Akinori Ogata promoted his foundation for children with serious illnesses on MB’s #63 that finished 23rd. Rounding out the Bottom Five was B.J. McLeod, fresh from his Cup debut last week, whose #45 Tilted Kilt Chevrolet edged teammate Korbin Forrister’s #08 by a single lap. Saturday’s race ended in thrilling fashion with the first NASCAR victory of John Wes Townley, who stretched his fuel in the final laps to win in Athenian Motorsports’ #05 Zaxby’s Chevrolet. Curiously, Las Vegas was the very first race after a report last Wednesday that the Athenian team would withdrew Townley’s XFINITY Series ride at Dover, choosing instead to focus on his Truck Series effort for the rest of 2015. Despite a number of on-track struggles throughout his racing career, Townley has not finished last in any of his 87 XFINITY Series and 73 Truck Series starts. Also of note was the return of 2007 LASTCAR Truck Series Champion Wayne Edwards, who made his first series start in more than three years. Still ranked second by one finish behind Johnny Chapman for the most lasts in Truck Series history, Edwards came home 24th in Premium Motorsports’ #94 Testoril Chevrolet, the last truck to finish under power. *This is the first last-place finish for the #50 in a Truck Series race since last fall at Martinsville, when T.J. Bell’s #50 Dedicated to Electrical Linemen Chevrolet busted a radiator after 44 laps of the Kroger 200. 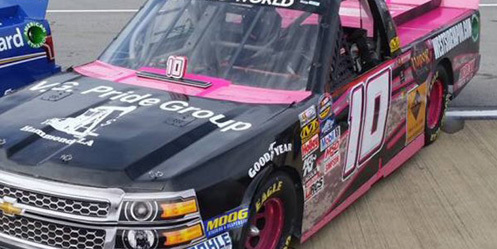 Neither the number nor Tanner had ever finished last in a Truck Series race at Las Vegas. LASTCAR.info is proud to announce its associate sponsorship of Joey Gase and Jimmy Means Racing’s #52 Donate Life Chevrolet in the upcoming Drive for the Cure 300 NASCAR XFINITY Series race at the Charlotte Motor Speedway on Friday, October 9, 2015. The site will join more than 20 other supporters whose names, photographs, and logos will appear on Gase's hood as part of a promotion with Racing2Cure.org, a cancer research initiative. A family-run operation like Means Racing itself, LASTCAR.info consists of brothers Brock and Miles Beard, who conceived of the website during the 2008-2009 offseason. What started as statistical updates on NASCAR’s last-place finishers has evolved into full race reports and features on teams and drivers who fight from the back of the pack - both in NASCAR and in other forms of racing. The site has been featured on NASCAR.com, Jayski’s Silly Season Site, “Doin’ Donuts” on RaceTalkRadio.com, “Manifold Destiny,” and “The Carey and Coffey Show” to name a few. The brothers also report trackside at the Sonoma Raceway in their native northern California. This is not LASTCAR.info’s first foray into associate sponsorship in NASCAR. In September 2011, the site purchased space on Steve Park’s #35 “Ol’ Blue” Tribute Chevrolet, a Sprint Cup Series ride fielded by Tommy Baldwin Racing for the Sylvania 300 at the New Hampshire Motor Speedway. Then in February 2013, LASTCAR.info supported the Daytona 500 effort of Brian Keselowski and the #52 Wreaths Across America / Highland Wealth Advisors Toyota from K-Automotive Motorsports. While both cars barely missed qualifying for their respective races, Gase is locked-in to the Charlotte race by virtue of his current 21st-place spot in Owner Points, securing the site its first race-day appearance. 2015 has been a tumultuous year for Gase and Means Racing. In their fourth season together, Gase stormed the iconic #52 to a career-best 5th-place finish at Talladega in April, besting such Sprint Cup stars as Kasey Kahne, Aric Almirola, Elliott Sadler, Regan Smith, and Kenny Wallace. For Means, it was the veteran’s first-ever top-five finish in a sport he joined as an owner-driver in 1976. Then as now, hard work and persistence have been rewarded, and the team remains both a respected member of the garage and a fixture on the racetrack. LASTCAR.info is thrilled to be a part of this effort. So stay tuned on Friday, October 9 to the NBC Sports Network at 8:00 P.M. Eastern and on Twitter with the hashtag #LastMeansFirst as Means Racing and LASTCAR.info team up for 300 miles under the lights!